Some 15 miles west of Clinton, Oklahoma is yet another town that “bit the dust” at the hands of Superhighway I-40. 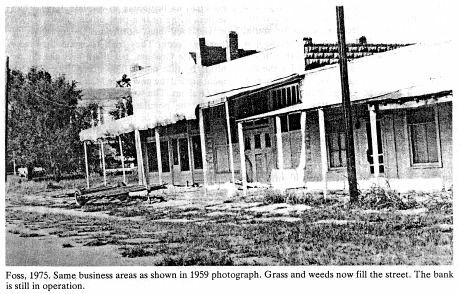 Foss got its start in the late 1890s when people began to populate the valley of Turkey Creek. However, when a flash flood occurred on May 2, 1902, it pretty much wiped out the town, washing buildings away and drowning several people. 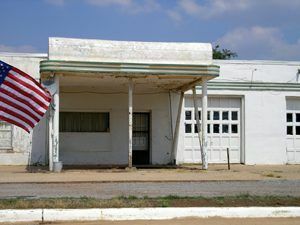 Kobel’s Gas Station still stands in Foss, Oklahoma but, appears as if it could be overgrown quickly. Kathy Weiser-Alexander, September, 2007. Not tempting Mother Nature again, the surviving residents moved out of the creek bottom to higher ground and the new town was called Foss. The fertile farmland surrounding the area attracted many early settlers and Foss grew to a population of almost 1,000 people by 1905. 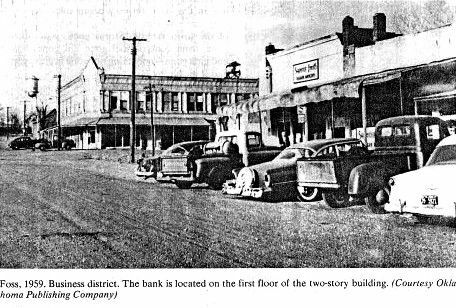 Soon all manner of businesses sprang up including two banks and three cotton gins. Stone buildings replaced earlier frame structures, a school system was organized, and several churches were built. By 1912, Foss had an electric plant, two hotels and an opera house. After the town’s initial rapid growth, it stabilized at about 500 people. However, in the 1920’s the town began to struggle as the nearby rail centers of Clinton and Elk City began to absorb much of the town’s former trade. Later, the Great Depression and the Dust Bowl of the 1930’s created further migration from the area. Still, the small town hung on and in the 1950’s saw a revival due to the increased use of the Air Force Installation at nearby Burns Flat. However, the base closed at about the same time that Foss was bypassed by I-40 and those few remaining people began to leave. Finally, in September, 1977, the one bank left open in Foss closed its doors forever. Today, Foss is but a reminder of its former past. The ruins of Kobel’s Gas Station, which also served as a café and bus station, still remain. An 1894 Baptist Church building and a pioneer jail are also left standing. But, of the rest of the town, there are only a few homes, and foundations, where businesses buildings once stood, one can only see vacant sidewalks, lining ghostly blocks that will never be used again. Nearby is the Foss State Park, just some ten miles north of Foss. The 1750-acre park and 8,800-acre lake features 120 campsites with hiking trails, a swimming beach, boating, water skiing and fishing. 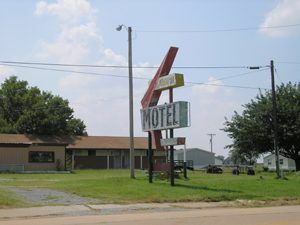 The old Washita Motel in Canute, Oklahoma, Kathy Weiser-Alexander, September, 2007. After leaving Foss you will soon enter the very small town of Canute, Oklahoma. Established in February, 1899 by an independent town company, it was named for the King of Denmark. The small town serviced the now-defunct Rock Island Railroad. 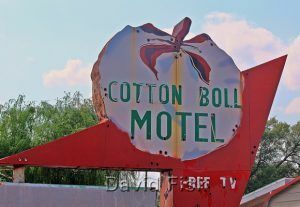 Following the advent of the automobile, Canute became a popular stop along U.S. Route 66 and a large number of tourist businesses including gasoline service stations, motels and restaurants. 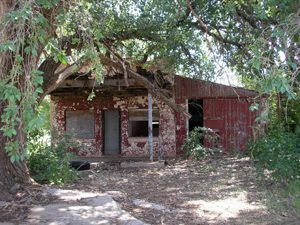 In the 1930’s, men were put to work by the Work Projects Administration (WPA) buildingOklahoma’s first state park on Route 66. Unfortunately, Canute was bypassed by I-40 to the north in May, 1970 and immediately went into a decline. Its decline was furthered by the closure of nearby Clinton-Sherman Air Force base at Burns Flat, leading most of those businesses to shut down. 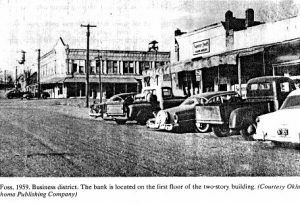 Today, this little town of just a little more than 500 residents provides a peek at a 1918 jail, the old Cotton Boll and Washita Motels, the Tip Top nightclub, and a soda shop called Thelm’s Sundries. Also, on the eastern edge of Canute is an old Catholic cemetery that features a replica of the crucifixion scene. Though very small and obviously long past its glory days, Canute shows its Route 66 pride in the restored Canute Service Station at the junction of Main and Route 66. Continue on your journey through the rolling red hills and farms to Elk City. © Kathy Weiser/Legends of America, updated May, 2013.